This app it the best! This app made my connection worse. Absolutely nothing will load. Then when I turn it off, my connection is fine. This app is very very good in the world. I don’t like to use cellular data at school so I use VPN to allow me to use the wifi to play games and get on Instagram. I’m not proud but at least I’m not bored. Don’t know too much about VPNs but this one is consistent, strong and free (although you can upgrade). Love this app, always works, no pay and gives me great internet. Didn’t slow down speed by much, worked great! سلام من فارسی مینویسم چون در نوشتن متن انگلیسی ممکن است دچار اشتباه شوم که پسندیده نیست. به هرحال اینVPN امکان دسترسی مناسبی رادر اکثر موارد فراهم میکند واین قابل قدردانی و ستایش میباشد. I love that I can use the VPN without paying membership.But I do have a question if I do get the membership does my VPN work better or does I stay the same? I know that I can always play my games now on the blocked WiFi at public school, super effective. The VPN worked fine at home in the US, but not while I actually needed it. In Shanghai and Qingdao I needed to use the VPN for accessing any websites, translator apps, etc. that I could normally from home. It took me at least 10 minutes to get it to work every time, closing and restarting the app, trying from different servers *if* it connected, and often being told I had no internet (with three full WiFi bars) or that they were diagnosing problems & to try again later... which still didn’t work after 24 hours. Overall I was lucky if it even worked at all, let alone for longer than 5 minutes. It would often drop me from my WiFi as it “connected”, repeatedly, and caused me to go back through the whole process mentioned above every five minutes (or less!) I had success with this VPN only twice for 30 minutes; but it was hell to get it there. To think I payed $13 for this kind of hassle. What a waste. This works a majority of the time, with some minor issues that you can fix yourself if needed. Sometimes the VPN takes forever to connect, or secures your LTE/3g connection instead of the WiFi, even when you’re connected to the WiFi. Other times it secures the connection, but the download and upload are extremely slow and never improve. If any of this happens, usually a reinstall does the trick. One other issue is when you walk away from the WiFi you have secured, it usually glitches out the app and your network in general. It usually fixes itself, but if not, a reinstall or network setting reset fixes this issue. One thing I’d like to see with this app is a way to cancel a connection you’re attempting. Sometimes I accidentally reconnect after disconnecting and I have to wait for it to reconnect again before I can get out. When it works this VPN barely hits my performance and I trust their payment model enough to believe they aren’t selling my data. That being said, the VPN itself is so unstable I wonder how much security I’m actually gaining. Two issues here: 1) The VPN randomly drops connection when online, and though it resets, I am obviously losing VPN status which I assume allows the sites I’m visiting to log my IP and activity while it’s down. 2) It’s hard to turn off. 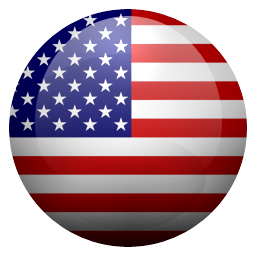 There are obviously circumstances where a VPN isn’t needed or desired, especially a free one. However, when I try to turn it off, this VPN often switches back on by itself and I cannot get it to remain off. In fact this is my second download. I deleted it the first time to see if that would fix the issue. However I see that I’m not the only one having that issue. Pro tip: don’t rely on this if you have something truly sensitive flowing over your traffic. It’s trash now. It used to be simple, reliable, and more importantly versatile (able to be used everywhere) with stable connection. Now they added a fancy button that doesn’t turn off when you want it to. Now it’s connection randomly drops. Now I cant even use it at school anymore. It works for a little bit then it does this annoying thing where it says its connected, but when I go on any app it “freezes” Like there’s a little clock thing in the middle of the button and it works when on the app but it clearly stops when you go off of it. On top of that, it has these fits where it won’t connect at all. Customer Support is a no as well. I understand having special features for premium version but denying people customer service for the app as a whole and not just premium is a scummy thing to do. The app is trash now. The ONLY reason I keep this app is cause it’s pretty much the only one that semi-works. As soon as I find a better one you better believe this is getting deleted. What used to be a simple and fairly reliable app is now nothing but an annoying headache. THERE IS NO WAY TO TURN IT OFF, if for example the connection is slow and you’d rather just connect to the net without a VPN for speeds sake. Even if you turn the vpn button in the ipad setting to off, it will automatically TURN ITSELF BACK ON, without user permission. This has always been a problem but I use to consider it minor because one could delete the app and re-download it from the app store as needed. EXCEPT, now instead of giving the option of logging in after downloading it is ONLY set up to force you to subscribe—if you already have an account, resubscribe. Even if you ALREADY PAID for a multi-device plan through your computer. I got charged twice basically because the app designers are too stupid to give the user the option to turn the VPN ON and OFF at will! China 🇨🇳 and my concern for security. On my trip to Beijing, China, I prepared a plan for the whole week and enjoy my holidays to the fullest, but I worry about safety in a different country with other customs, culture and laws totally different to what I may be used to, it was in that moment where insecurity took hold of me. In summary China 🇨🇳 is a country that controls the communication and information of its inhabitants and its visitors under strict laws. Here the questions begin; How do I protect my personal identity information? How do I protect the information I have stored on my phone? How do I protect the banking or government information that I may have stored on my phone or through an application installed on my cell phone? How do I prevent someone from accessing my diary, medical information or malicious intent to track down my location? Questions that we ask ourselves every day, but when you are in another country it is very dangerous. 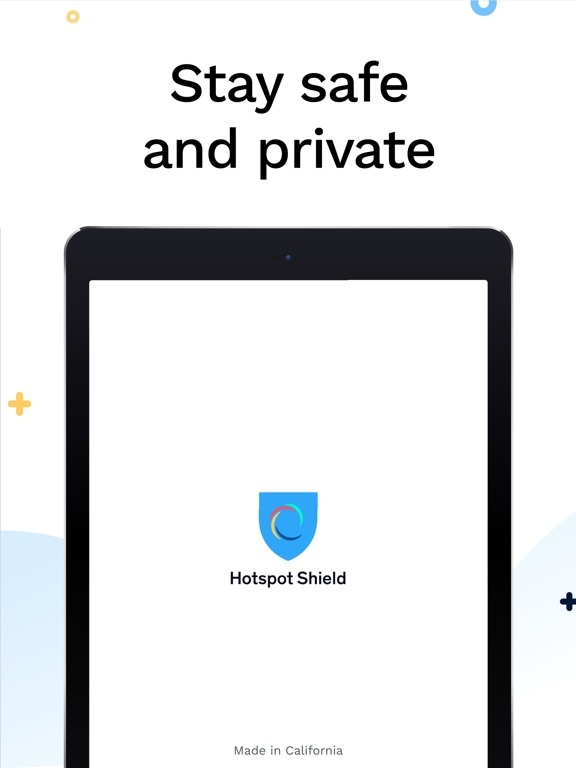 Use between 8 to 10 VPN applications to have the experience and without a doubt, HotspotShield was the only VPN that met my expectations 100%. I am in high school, and the phone I have I earned my own money to purchase. My family doesn’t have lots of money and we don’t have any payment accounts set up on a credit card. I use this VPN to access the internet at school to check grades and get assignments, but it stopped working for me. I don’t click 7 day trial, just kept clicking the X. Now it’s not working all for me which is horrible. I can’t find a single other VPN that works for me , believe me I’ve tried, and the fact that I have to spend money to get this to work is sad. I need this to help my education and paying it isn’t an option. I have the paid subscription of Hotspot VPN. Sometimes when I transition between WiFi to cellular connection, the VPN starts cycling connect/disconnect. This prevents me from getting a data connection. In this situation, I could not get a GPS app /server connection when I really needed it, even though I had a strong cellular signal. After troubleshooting, I figured out it was the VPN, so was able to turn it off and connect. This happened again this past week. The only problem this time was that I was unable to turn Hotspot VPN off. Every time I tried to do this in settings, including “connect on demand”, it would come back on within a few seconds. I finally had to delete the app so I could connect to a server and use my GPS app. Take time to read the reviews! Trust me! You’ll understand why they have a 4.5 rating! I downloaded this app thinking it would be helpful. Before I even really used it I just read a bunch of the reviews. I’m pretty sure most of the recent ones are fake. Usually that’s a sign that the developers are having issues and want to bump up their iTunes rating, or at least that’s what I understand. Because of that reason and that reason alone, you received a one star rating and I am deleting your app from my all of our iPhones and iPads immediately. If the developers or the people working for them are the ones behind the fake reviews I might suggest you take care of the issue immediately or other people will take notice, just like I did. 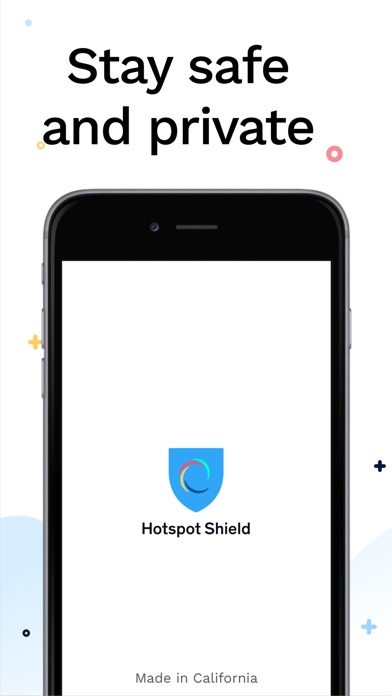 I’ve been using this app for over a year now and it’s been one of the only vpn apps where you don’t have to sit through a 5-10 second ad upon opening the app to either enable or disable the vpn. Connecting is always quick and the connection they provide has proven to be fast and reliable. I’ve downloaded a lot of VPN apps and this has been the best I’ve found. If you’re reading this I definitely would use this application versus a different vpn application. I hope this quick review helped you decide which vpn app to use. 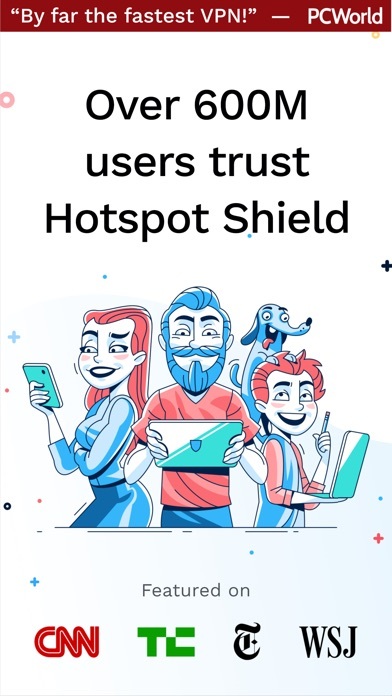 I really do like this VPN, it’s a great protection since I use public WiFi quite often in the week and full-time when traveling. It works as advertised. The only complaint is the almost-daily pop-ups that you have to swipe away to get into the app to enable/disable the VPN connection. In some cases I’ve had to get past two pop-ups asking to rate the program which wastes time when you want to quickly enable the VPN. As a Premium paying customer this is an annoyance and needs to be avoided and make the process as quick as possible. As a FREE VPN it works just fine. I've bounced between a handful of other VPN apps and frankly this is my favorite so far. I'm a free user, so I'm not getting ultra high premium speeds, but for making things work properly on my school network, it's just fine. I also super appreciate the way it shows how much data I've downloaded/uploaded each session; this seems to reset a lot when it's in the background but it's still nifty, and I haven't seen other apps that do this yet. Is it perfect? No, but it has a great free tier that has handled everything I've thrown at it, when other VPNs have failed it just keeps trucking. This app Is GARBAGE if I can rate it negative stars I would please don’t install this is soo bad you will spend 6 months trying to get it to work and it works for about 12 seconds and after that you have to spend another 17 years to try and find out how to make it work and then the same thing will happen again. If you even try playing games make sure your ready for it to crash in the middle of your game or when you need it the most and don’t even try doing anything actually important terrible experience never will download again unless they fix a trillion of the problems don’t install please it’ll be a waste of time and (if you buy the membership) money. Everyone at my school has been using Hotspot VPN since Freshman year, and at first I didn’t understand the hype. A week ago, I downloaded it and finally understood the buzz. It allowed fast and easy connection, and I could access certain apps that I couldn’t before in school. But, not even a whole 24 hours after using it, it started acting crazy. It starts randomly connecting and disconnecting and it’s really annoying to have to open the app just to connect again, only to have it disconnect five seconds later. Don’t get me wrong, it’s a good app, but the disconnecting thing is definitely a problem. Overall the VPN service is very good but I find it turning on when I don't need it. There is is a option in settings called connect on demand. I turn this off but for some reason is won't turn it off the app still auto connects. This gets very annoying because the wifi connection while using the app isn't as good as the wifi at my house when I don't need it. Overall it works with any application allowing you to view almost anything or use any application. I notice a lot of people are having trouble discounting from the VPN, there most likely are going though the settings app. You actually have to go in the app to then disconnect it. But I also noticed that sometimes when I do turn it off and then back on, it keeps saying that I’m on my data plan and even when it’s connected, it doesn’t pop up VPN next to my WiFi! Also during this it also keeps saying on my settings that my WiFi is connected, but it doesn’t pop up and it doesn’t work! But when the VPN does work, it pretty chill. You will get copyright infringements. App doesn’t work! I went with this company because they have a lifetime subscription. It turns out it’s only about 50 years. But worst comes to worst I’ll buy the subscription again. It does not work with Adblock on the iPhone. I believe it does on the computer. I haven’t run into any problems it’s pretty solid for whatever platform you’re running this on. Also you can cover multiple devices (5) in one account. I also have peace of mind with this app. That’s worth the subscription cost. I do like this app, and it has a nice user interface, but it really needs some reworking in terms of connectivity, because I cannot use this app in about half of the places I visit after using it for a few weeks. 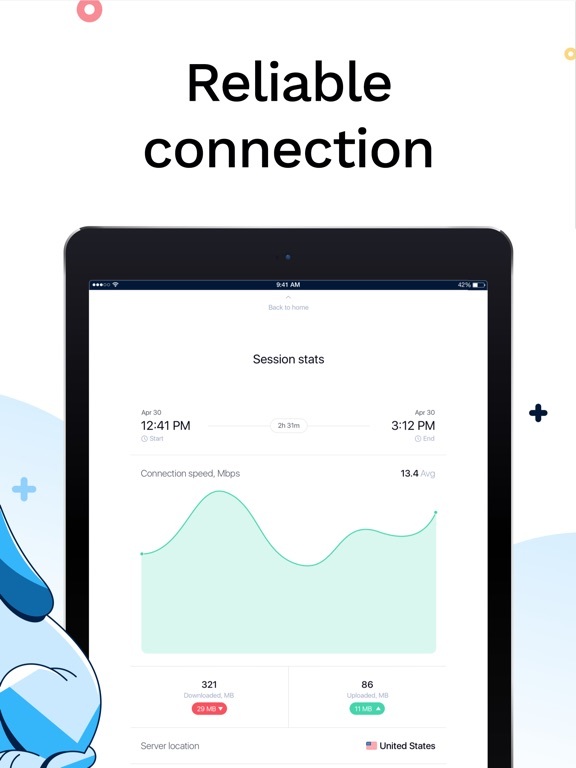 I don't know if this uses a different type of protocol, but other apps like VPN 360 connect pretty much no matter what, so I don't know what's causing the difference in usability. Additionally, if you leave a WiFi field and try to connect to another one, the app will prevent you from joining any other network until you uninstall the VPN profile. When I first got the vpn it worked just fine, fast connection, reliable, etc. However, in these last few months it’s gotten worse and worse. The connection is now very slow. It takes about 5-10 minutes to load one webpage. It also keeps taking time to load, meaning it stops working for a few seconds before turning back on, then it does it again, etc. The little vpn icon at the top keeps flickering. Because of this websites will just stop loading halfway though, which means another 5-10 minutes of waiting. I’m highly considering switching vpns if this keeps up. Requires 2 IAPs for full speed. 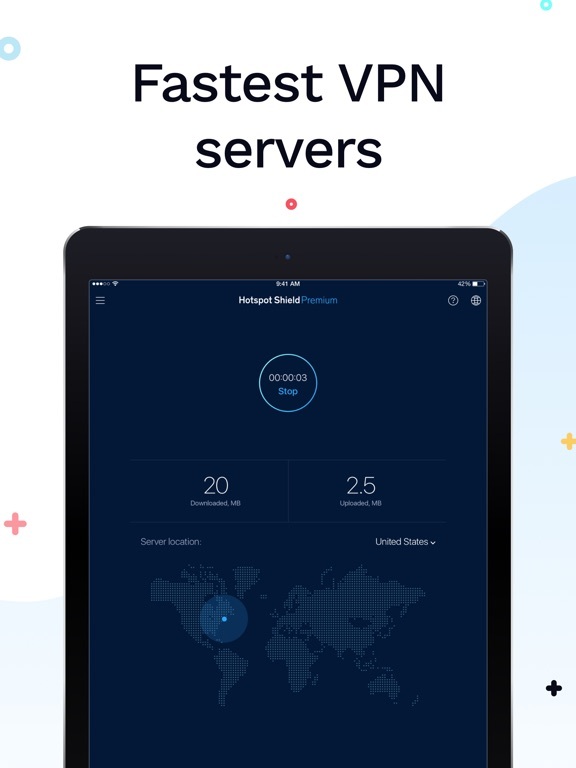 I was looking for a replacement for VPN unlimited which has become practically unusable for me on multiple platforms. I liked that this app allowed for simple set up and quick connectivity. Also, I like that this company owns and operates all of their servers. So I decided to try the premium subscription but was disappointed to find out I had to pay even more for full speed. If the normal subscription price was more competitive I would not be bothered by that. However the base subscription price is already higher than other services so I decided to cancel the subscription and continue trying other services. 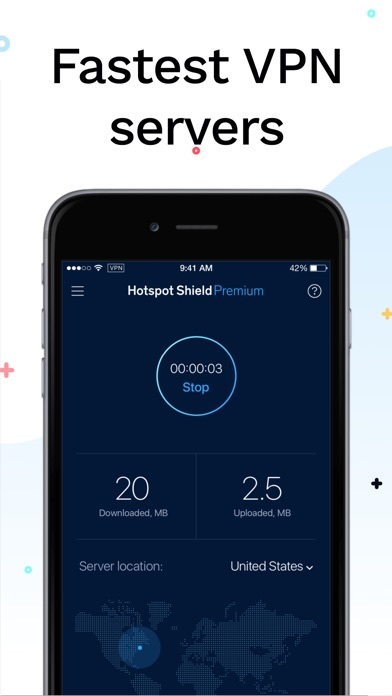 Well, with Hotspot U R always in the Right Spot because it is YOUR choice, free version is good but for a few pennies more you get to B where U want 2B & that is not the question but a choice! This is my second time writing a review and using my most, “Valuable Resource,” which is my time, as we all, yes all, only have the next moment of time. Remember, “Everyday is a Gift,” so why not use that gift privately when you are on-line and keep your time as your time and only your time with, Anchor HotSpot Shield! So yeah, they don’t spam you with ads, I don’t think I’ve ever seen one, they just politely request to buy a premium thing every now and then but hardly even that. It works well, super easy to use, just push the button and you’re good to go. Been avoiding my school’s web filter for years with this thing and it works great. 5/5 would recommend. Now excuse me as I waste time in school playing a game that normally would have been blocked. I’ve used this VPN at school for years, and it’s never had problems. The only thing I would ask is for there to be a way to turn it off using cellular data because it won’t turn off when I am not connected to WiFi, and then my cellular data won’t connect. So I have to delete the app and re-download it the next day when I need it. But honestly that’s just because I forget to turn it off when I leave school. 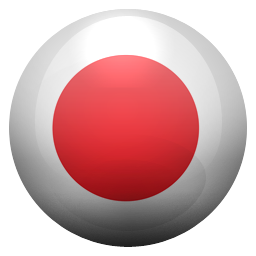 This is a great app and I've always used it on the desktop. My only complaint so far about the iOS app is the requirement to sign up for the subscription before I'm allowed to enter my standard login information. Then I have to go to the iTunes store to cancel before my free trial is up????!?!? How about you just put a standard login button when opening the app for the first time... Ridiculous! Fix that and you'll get the other two stars back, no need be taking advantage of the people who don't know how to find these things. Have had only two issues over past year in using HHS Elite- first, could not get the App to run on my desktop Mac which is a secondary issue since I mainly need it for mobile devices and WiFi connections, and secondly, in just the most recent iOS HHS version update (v3.8) I could get it to successfully download & update the mobile App normally using the App Store on an iPad Pro without deleting the App first for some unexplained reason (even after contacting tech support). 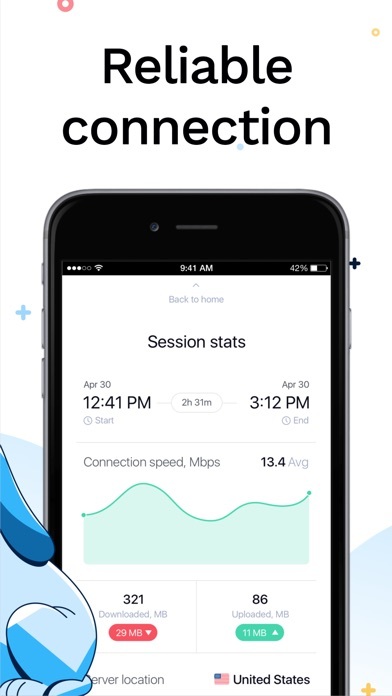 This app offers amazing speed, even on free. It works most places, including my school which has blocked about every VPN on the store. Usually any bugs can be fixed with a simple app restart. 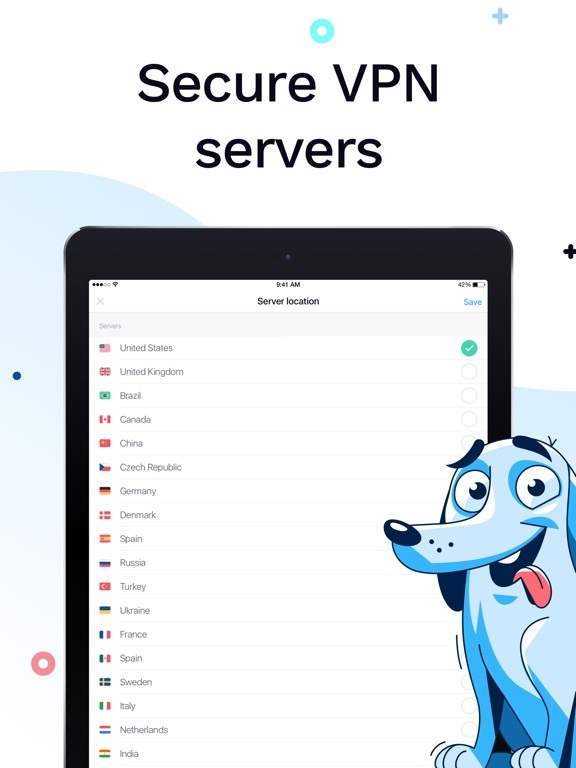 I would seriously recommend this app to people who need a vpn on any device. The only problem is that if your playing music and enter the app, the music will stop. But either way, 5 stars. Keep up the good work. I love the service and the premium account is worth it if you can afford the price. 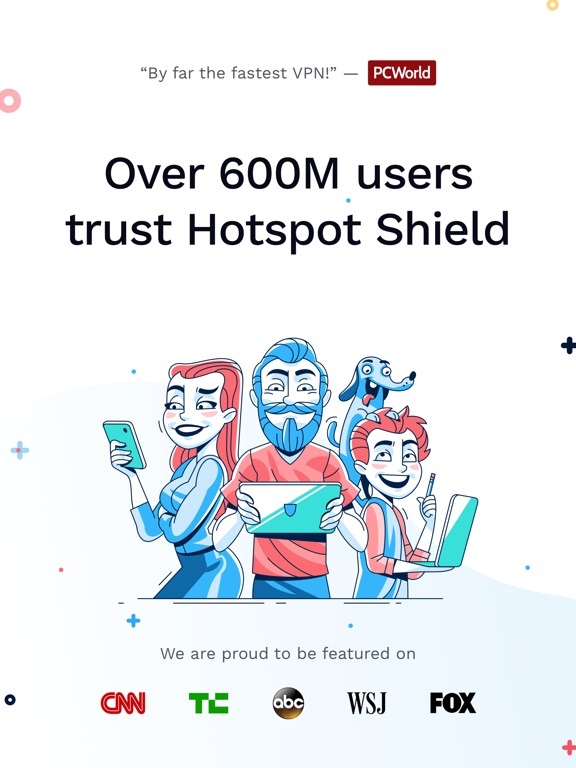 I just wish hotspot offered a build your own plan like some other VPN’s. Sadly to pricey for me so I will have to stick with my current paid VPN. Current VPN I’m subscribed to let’s you build your premium subscription starting at just $1 and an extra $1 for each additional feature. So $3 a month vs hotspot price. Mind you hotspot is one of the best VPN subscriptions out there but sadly it’s to pricey for most. This app works great on all my apple devices except for iPhone X. I’m not sure if it’s phone software issue or app issue. I have to delete and reload it about every day or two to get it to work. 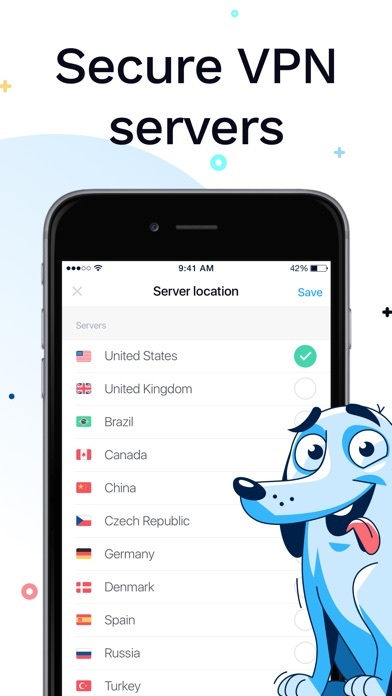 I would recommend it to anyone looking for a good vpn app. The customer service is great as well. I had a problem with my subscription not showing up an they had it fix with in an hour and gave me the days back that I had missed. This app works amazingly and is free, I'm glad to have it. Would get 5 stars if there was an easier way to turn it off, since when I leave wifi range the app keeps trying to connect on my data, and since it can't connect on my data, I end up not having any connection until I turn the VPN off but there's no clear off switch so I just kinda tap the loading button a bunch of times until it turns off. This review is not for Apple-savvy individuals (who may scoff at this review), but for those that don’t understand what you may be downloading. Just know, if you download this, it creates an auto subscription, which will charge you $13 every month. Deleting the app will not get rid of the subscription, and you will continue to be charged whether the app is on your phone or not. Apparently this is common knowledge for some, but to those who are not as familiar with how Apple and ITunes work, know that you cannot get rid of the subscription by simply deleting the app. And good luck trying to get Apple to refund anything past 60 days. I like this but could use more speed and please please please! Make it unlimited! I use the vpn to watch shows on a site but recently it’s been acting very slow but on using the vpn it was instantly loaded (every episode is about 30 minutes) this means I can only watch a bit before it tells me YOUR OUT OF DATA! I want to but I DON’T PAY MONTHLY! I want to use the free trial but I have to pay strait after BUT I DON’T WANT TOO! Plus it’s far too expensive to get a plan so please make it a pay once thing than monthly and make the free trial S.E.P.A.R.A.T.E! YOU UNDERSTAND?! After reading what turned out to be a long commercial I downloaded it. Thinking that it would be pretty solid for free. It clearly states you can use free option if you choose. I chose. Only it wouldn’t let me lol. It was trying to muscle me into a contact for something I really don’t need . I was going to keep it free just for occasional use but at that price I think not. You can’t cancel until the promotion is expired with their obvious hope that you will forget to cancel. Then at least one or two payments get by . Nice try, I do respect their hustle. So they received two stars lol. I mean it works but don’t expect it to work with the same speeds as using the internet without a VPN. Never had any issues, although I would prefer to choose server location and to be able to use multiple devices, but it only lets me use 1.🤷🏼‍♂️ Zenmate VPN is good for these on chrome browser and tunnel Bear is faster but you only have a certain amount of allotted data per month on free account. BY THE WAY, all of these listed have free usage for life. Treating elite members like garbage! I bought the elite about 15 days ago. In my apple account it says the subscription expires weeks from now. I am signed in to the Apple ID I made the purchase with and yet it tells me my Apple ID has no recognized account with an elite subscription. Contacting them is not working. When I try to send for contact help it tells me MY internet connection is at fault! There is no problem with my internet connection, the problem is with this app and it’s creators. 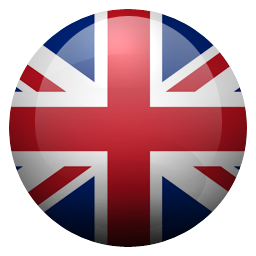 EDIT- new problem, most of the VPN locations offered to “vip” paying members lead to the UK. Sweden, China, Denmark are all using United Kingdom VPN connections. And the UK heavily filters their internet. I recently tried this app and I downloaded to my phone within hours I’m being notified that a fraudulent app is trying to steal my information. So I deleted it. And then I read all the great reviews and I’ve never had an issue like this before so I re-downloaded the app a week later thinking I was just over reacting. This time within minutes I was notified several times that a fraudulent not trusted app was trying to steal all my information. I normally don’t write reviews but I feel this is important for others to know that if you download this app your information may not be safe I hope this helps someone.